Ultraviolet photo of a Hyacinthus orientalis plant in flower. 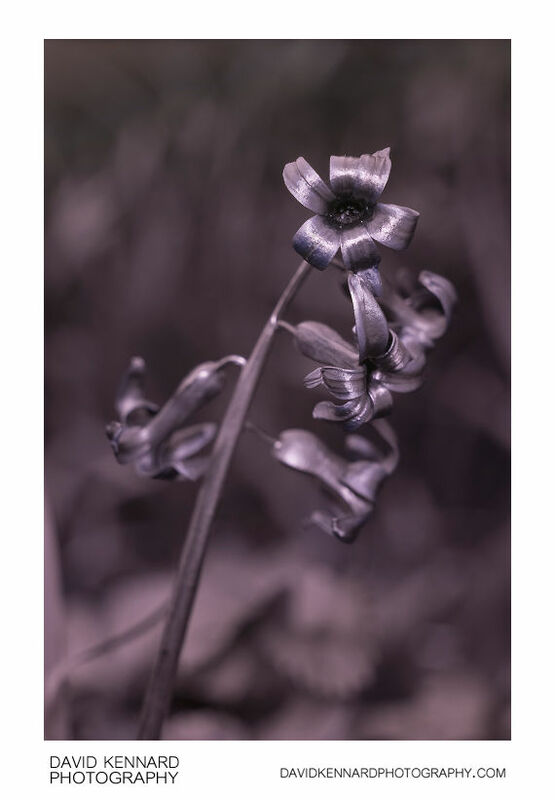 In ultraviolet the flower petals appear quite dark, and have little variation in tone across the petal, unlike in visible light where the centre of each petal is a darker purple than the edge. The throat of the flower appears much darker in ultraviolet than it does in visible light. What might appear to be a white ring shape around the centre of the flower in this photo is merely a reflection of the flash used to help light the image. Benro tripod with reverse mounted centre column. Geared head and focusing rails. Remote shutter release. Full spectrum modified Vivitar 283 flash fired straight on to light the inside of the flower, combined with natural light. 2 images with slightly different focus.